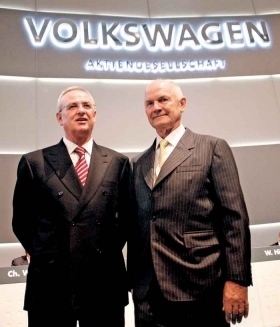 Over the years, Piech's collection of VW brands -- ranging from European value brands such as Skoda and Seat to superluxury marques such as Bugatti and Lamborghini -- has taken fierce criticism from shareholders, labor unions and journalists. In the United States, VW has ambitious plans -- and significant challenges. Click here to read the full story in ANE's Executive Edition. -- Growth vs. profits: Toyota Motor Corp. had a fast-growth strategy -- and paid a heavy price through sinking profits. Now Volkswagen runs a similar risk of sacrificing profits to growth. VW is the world's third-largest automaker but ranks seventh in terms of operating margin, CFO Hans Dieter Poetsch recently said. -- Skeptics: Piech's big goal has drawn a crowd of skeptics. "What's the value of being No. 1 anyway?" asked Klaus Fricke, CEO of German plastics supplier Dr. Schneider Kunstoffwerke GmbH. "What did it do for GM? How long was Toyota No. 1 before it cratered in quality and perception?" Fricke said he believes it makes more sense to be No. 2 or 3, and focus on profits, adding: "I am sure that Mr. Piech and Mr. Winterkorn are well aware of that fact.